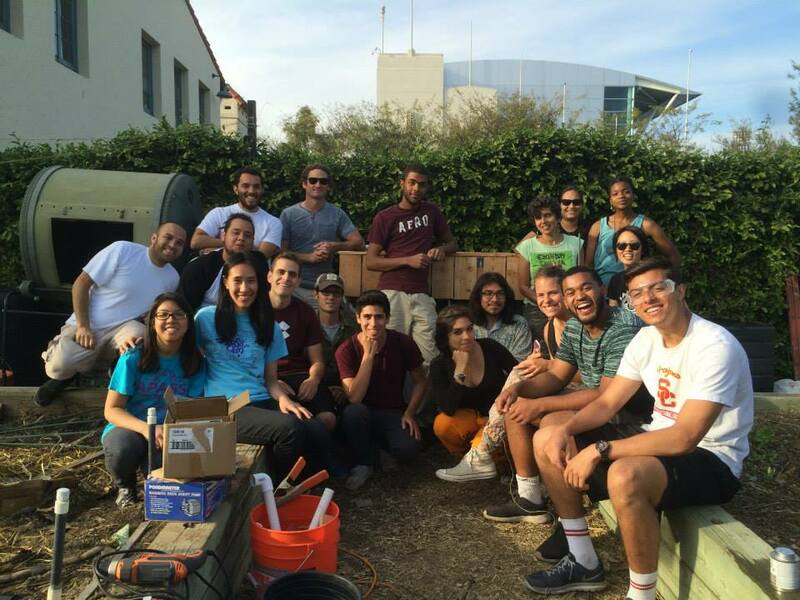 Below are two posts from students in the WIES 2015 Spring Break Aquaponics Workshop. Thank you Jacqueline and Crystal! A good friend of mine grew up in South Los Angeles, never graduated high school, but lives one of the healthiest, most conscious and relaxed lifestyles I’ve come across. Every day after work he comes home to customize his surroundings for artistic and functional purposes. He primes his canvases, paints found sculptures and carves faces into tree stumps that he repurposed into indoor planters. Recently he tore down part of his second-story wall and installed a door to create a rooftop patio and, per my suggestion, build an aquaponics system. I once told him that the charm of his room came from it being so DIY. 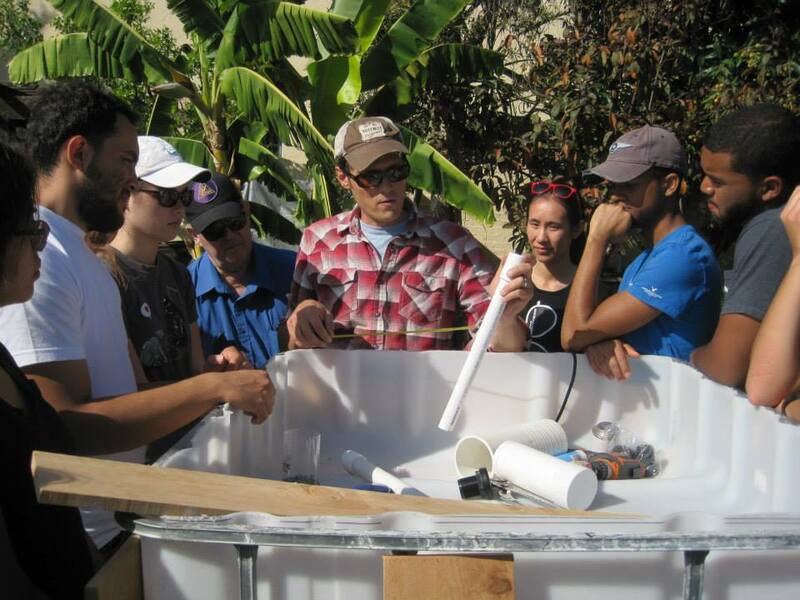 This spring break, I took the Wrigley Institute’s aquaponics workshop, led by EVO Farms’ David Rosenstein and ended up with a wealth of information on the endless facets of aquaponics. Much of it built on my previous biology education– I now better understand the nitrogen cycle, for example, and I know that pH levels in these systems are a compromise between fish and plants. And though I’ve yet to test my knowledge on this one, I do understand the procedure for humanely killing your soon-to-be grilled catfish. David explained plumbing, sunlight, and dissolved oxygen in the classroom, while we privately visualized designs for whatever outdoor space we might come across. What if I want to integrate frogs? What would it take to feed two blocks’ worth of families with the raft method? I can’t kill a catfish…maybe I’ll go with inedible fish varieties. However, whatever abstract ecological models I envisioned during lecture gave way to the lesson I learned while actually building the systems out in the sun, with dirty hands, surrounded by other students and experienced adults. My biggest realization was one that humans depended on for tens of thousands of years: I am physically and mentally capable of constructing structures for a common good. The academic life is one I enjoy very much (even at 3am at Leavey Library) but being highly sedentary, it isn’t conducive to making full use of our evolutionary adaptations. As it turns out, hands are useful for more than typing, flipping pages, and pointing to the kale and kumquat salad at the store. Hands are a key actor in operating chop-saws, clipping at hard plastic, and washing residue out of hydrocorn. Fingers are especially well-equipped for threading plumbers tape around a pipe. Several large muscle groups were also necessary, but I consider hands the quintessential poster-child of versatility, especially for creating physical solutions that we tend to pay someone else to complete. There’s empowerment in building big things yourself, and there’s a shared enthusiasm when building with peers. I recently pulled out a statistic for an environmental law paper– 72% of restaurants in South Los Angeles are fast food establishments. 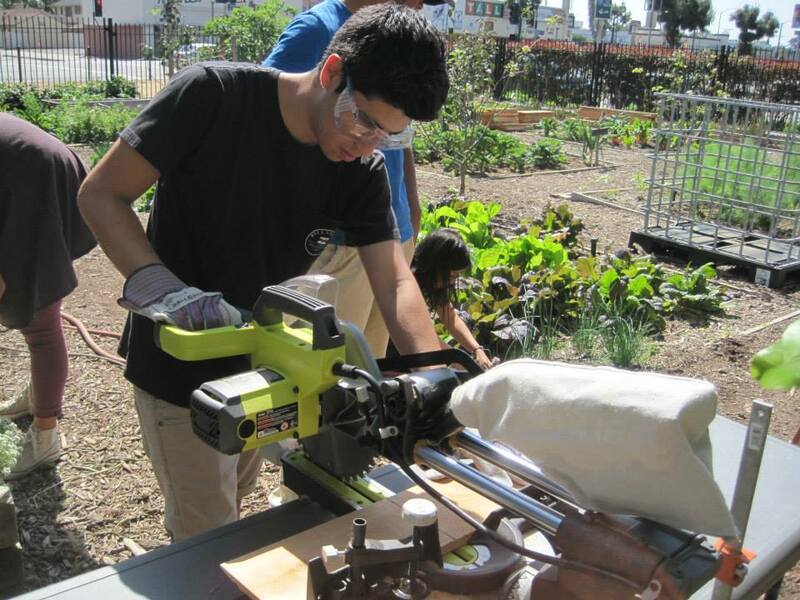 The “food desert” problem exists in USC’s area. The situation is often discussed within the confines of a classroom, where the conversation leads to theoretical solutions time and time again. 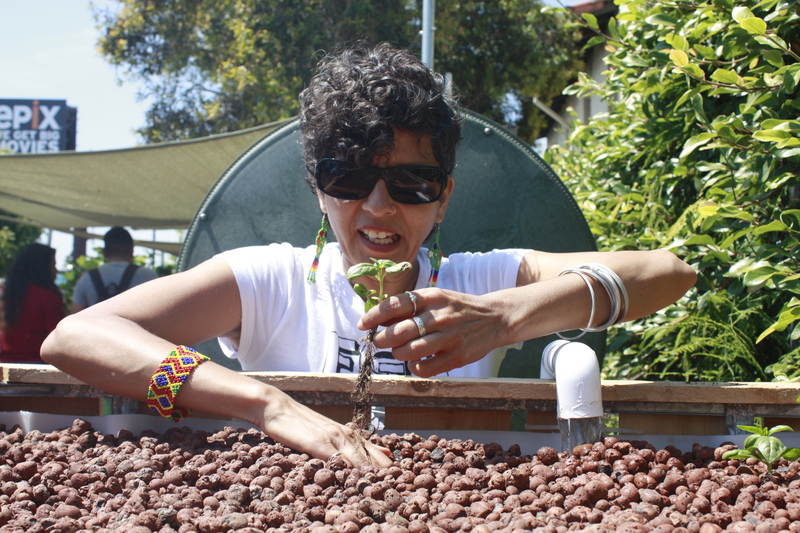 David’s lectures encompassed the role aquaponics can play in providing decentralized, healthy and –as the non-profit Community Services Unlimited calls it– “beyond organic” produce and protein in our own neighborhoods. Though much of the workshop was about decentralizing our food sources, it was also very much about decentralizing the work that goes into it–to the point where people like me are no longer hesitant to carry wood planks and wield power tools. 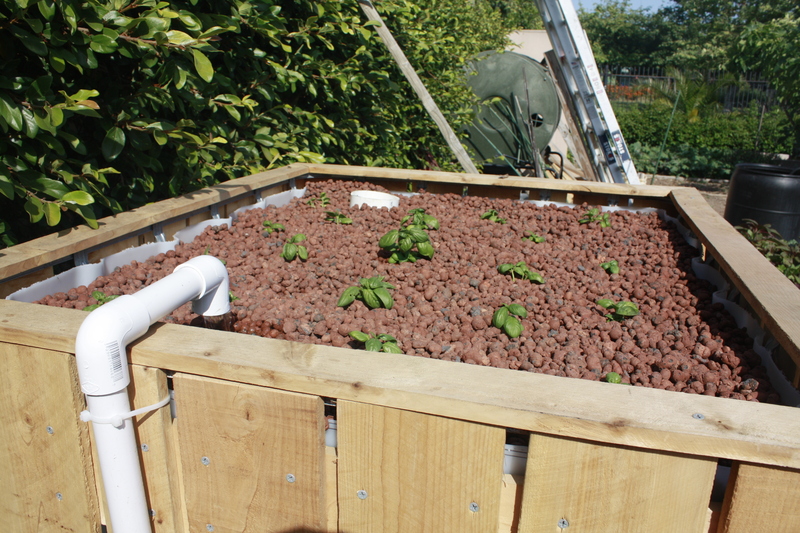 By the conclusion of the three-day workshop, our diverse team of two-dozen ended up with two medium-sized aquaponics systems with plumbing successfully installed and decorated with wood and PVC skirting. Our three days of work won’t solve the food desert problem, but they were a tangible answer to it. And my hands have since gone rogue. The Microsoft Word and my iPhone keyboard no longer hold a monopoly over their time and aspirations. These hands still write essays but they also redo the floor of my new room, they sketch out the food justice-themed murals they will paint, and they are getting ready to build my own aquaponics system on my equally DIY rooftop patio. Aquaculture, agriculture, and plumbing have never been things of interest to me, in fact I knew very little about any of it. But what I did know, was a strange contraption that could grow vegetables vertically in your backyard that grew three times faster than it could out of the ground, and watered itself! 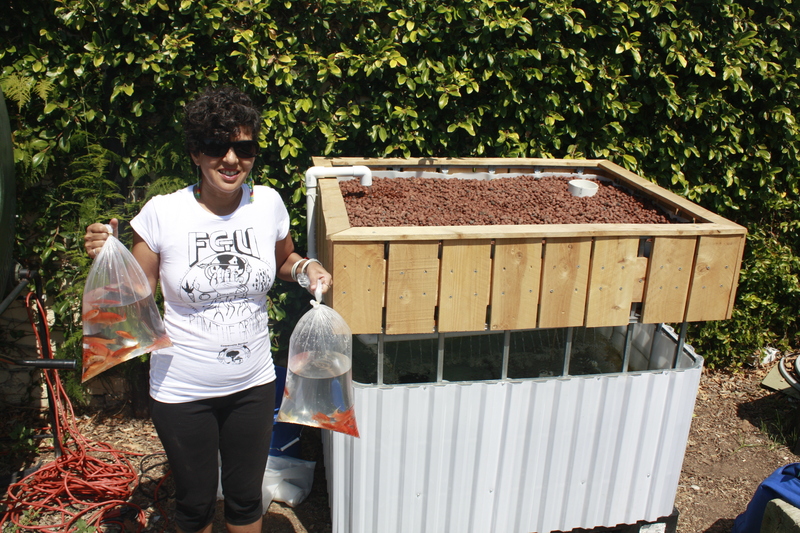 When I received an email about an aquaponics workshop at USC, I immediately signed up and counted down the days to receive what I expected to be, magical information. Little did I know that I would be so fascinated, inspired, and extraordinarily excited to get started on my own system after just the first hour of the three day workshop. Every moment of the workshop I felt one of three things: one, smitten with awe with simply everything David Rosenstein said; two, occupied with thoughts about how to build one at home; and three, how I could make aquaponics a part of everyone’s lives and not just my own. The workshop’s lecture material was the best time I’ve ever spent sitting in a chair and staring at a lecturer, hands down. Building the system with the team and completing the work on day three was not only fun, but was in such an amazing environment with people and plants that anyone would love to spend a Friday afternoon with. I am so excited to start designing and making one of my own and have been sharing the stories and information I’ve learned at this workshop with everyone I can catch a few minutes with (sorry guy on the bus who probably didn’t want to talk to anyone). If the Wrigley Institute offers this workshop, or another like it, TAKE IT. Best advice possible, guaranteed. This entry was posted in Undergraduate, Wrigley Institute on April 16, 2015 by Jessica Dutton.